Deerfield is an active, vibrant community with excellent parks and facilities for athletics. In support of this, the park district develops and maintains a variety of leagues, classes, camps and reserved times for pickup sports. The Deerfield Park District offers adults the opportunity to play in the softball and basketball leagues. Form a team with your coworkers and friends for a competitive and fun evening after work! Archery is a sport for all ages. Learn basic shooting form and techniques to hone your aim, precision and archery skills. With the crack of the bat, it’s going, going, gone! Baseball has been America’s past time for generations. We’re doing our part to pass on the love of the game to future generations, with in house T-Ball programs and camps. Youth leagues are hosted through Deerfield Youth Baseball and Softball Association. 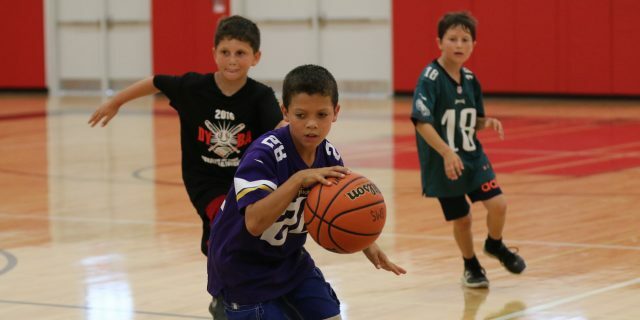 Each fall, the Deerfield Park District offers youth house, youth travel and high school basketball leagues. Adult leagues are offered year-round. Whether just learning the game or if you have been playing for years, let our leagues be the place to hone your skills and enjoy spirited competition alongside your peers. There is a class at the Mitchell Park Basketball Courts on Mondays from 6:30 to 7:30pm from June 11 to August 6 and one court will be unavailable. Interested in learning the fundamentals and mechanics of Floor Hockey? A fast paced game played between two teams of six players to a side, on a flat surface the size of a basketball court. Learn how to score points and hit the puck into the opponent’s goal. Young Warriors Youth Football is an affiliate organization of the Deerfield Park District. Their tackle football program for grades 4-8 concentrates on football basics, with an emphasis on instruction and fundamentals. Whether you’re a beginner, a junior or an advanced golfer, the Deerfield Park District has various golf programs designed to help learn the basics of the game or to simply fine-tune your play. We have a state-of-the-art Golfer Development Instruction Program, designed to allow new golfers to learn the fundamentals and hit the course quickly. Our curriculum includes the basic fundamentals of setup, swing, short game, golf etiquette and rules, equipment, attire, pace of play, strategy, and even logistics — like how to make a tee time and how to drive a golf cart. Golf is a game for a lifetime and it is great to play with family and friends, so find a partner and enroll now. Our teaching facility is unlike any other in the Chicago area. It includes private lesson and short game areas, two large practice putting greens, and practice sand bunkers. The Deerfield Park District partners with Illinois Girls Lacrosse Association to offer spring and fall travel teams and much more. Be a part of a youth lacrosse league exclusively for girls. The emphasis of this program is to develop the girl within the sport of lacrosse. The goals of the program are to understand the rules of lacrosse, promote teamwork and sportsmanship, and foster personal development in a respectful environment led by positive coaching. All players will receive equal playing time. Practices are one day per week and games will be played on Sunday afternoons. Sunday game locations rotate within your division. For any questions you may have please contact our Athletics & Fitness Supervisor Jim Gariti. The park district relies on outstanding local instructors for the martial arts classes we offer — IL Shotokan Karate and KH Kim’s Taekwondo staff. Classes are offered year-round at Sachs Rec Center and there are options for all ages and skill levels. If you like music, dance, tumbling, and creativity, you have to try rhythmic gymnastics. It combines the beauty and artistry of dance with the strength and power of tumbling. Gymnasts perform routines to music using hand apparatus such as ribbons, balls, hoops, ropes and clubs. Our soccer programs are among the most popular in the catalog; fortunately we have partnerships with some great organizations. American Youth Soccer Organization is a nonprofit, all volunteer, national organization that promotes youth development through soccer. Pegasus FC is an Illinois not-for-profit corporation created for the purpose of encouraging and supporting the expansion of soccer opportunities for boys and girls who exhibit advanced ability and interest in soccer. Adults have a weekly opportunity to lace up their soccer shoes and shoot for the goal, work on new skills and get in some excellent cardiovascular exercise. Teams and games will be based on the number of people who show up each week. Please call the sports hotline, 847-317-2555, each Wednesday night for updates. DYBA is proud to be affiliated with Deerfield Park District. Our games, practices and other events are held on almost 30 softball and baseball fields maintained by the park district. All registration for the spring and summer seasons will be done on-line. Please check the DYBA website for announcements about registration as well as information about off-season baseball and softball clinics. Dana Joseph and Chris Cabanban of First Serve Management and their team of instructors provide tennis services indoors at SRC and at Deerfield Park District’s outdoor courts. The mission of First Serve Management is to nurture the love of the game of tennis. First Serve Management offers family-friendly programming that encourages students to play the sport for a lifetime and provides a path to pursue the level they wish to attain. From beginning recreational players looking for fitness and fun to tournament competitors, instructors understand that people of all ages play tennis for different reasons. They believe tennis brings people together—families, friends and new acquaintances, who then become friends through tennis. The quality and experience of their teaching distinguishes First Serve Management from their peers. Their entire staff is certified by either the USPTA or the USPTR and is constant from the start of a lesson session to the end. Deerfield Park District owns and operates eight outdoor tennis courts, two of which are lighted for night-time play. Lessons are taught by First Serve Management for the Deerfield Park District. During these times, we invite you to use Deerspring Park Courts, 200 Deerfield Road. Lessons are taught by First Serve Management for the Deerfield Park District. During these times, we invite you to use the Mitchell Park Courts located on Wilmot and Hazel. All outdoor courts are free. There are no attendants. Players are to use the rack-up system. No more than 3 balls per court. Courts change on the hour regardless of when play starts. To reserve a court for play, hang your racquet in the designated area for that court prior to the scheduled court change. Yield courts promptly at the scheduled time. Please be considerate and allow points in progress to be completed without interruption. Two air-conditioned tennis courts are available for rental to the general public when they are not being used for lessons or other programs. Residents may reserve court time up to seven days in advance. Non-residents may reserve courts 48 hours in advance. Court time must be paid for at time of reservation. If a reservation is cancelled 24 hours or more prior to the scheduled court time, the fee will be refunded. If the reservation is cancelled within 24 hours of the scheduled court time, no refund will be given. All cancellations must be done by speaking with a front desk staff member. Voicemail, email, or faxes are not accepted. Courts may be rented on a walk-on basis when available. Permanent Tennis Court reservation times are available. For more information call the SRC front desk at 847-572-2600. Track & Field combines the individual skills of running, sprinting and throwing while learning the benefits of becoming part of a team. Check out our camps and programs to hone skills or see if this is the sport for you. Bumping, setting, passing and spiking will all be taught as volleyball enthusiasts take the court and learn this energetic, fast-paced sport.